Through the period from 1996 until 2000 a new water purifying plant for cleaning wastewater from households has been developed at Syddansk Universitet, Esbjerg in Denmark with Peder S. Gregersen as key person. Since 2000 this work has continued in Centre of Recycling. Until now Centre of Recycling has given advice related for zero- discharge willowfacilities for more than 1400 households in Denmark and around 100 facilities without lining. Further also for some facilities abroard. A lot of the facilities are small joint facilities for 2- 73 households. In general it is much cheaper to establish joint facilities if distances are not to far between the households. Willow wastewater facilities are low technological plants, but the dimensioning of the plants is based on relatively complicated calculations and experience. It is due to the fact that the plants need to be dimensioned exactly in relation to a lot of parameters. Made too small the water will run over the edges and made too big the willow trees will die in dry periods or be damaged, when only few persons lives in a household. Done in the right way willow facilities will have the lowest operation costs and be very easy to manage. It is the only facility that will have a positive energy balance in its lifetime. It will simply produce the energy used for materials and for the establishment of the facility after very few years. All wastewater from households (black and grey) is recirculated in the willow bed. The first step is to settle fat and particles in a settling tank. The settling tank has to be emptied once a year so that particles will not flow to the facility and klog (stop) the spreading system. Normally the sludge from the tank will be emptied once a year and go to a municipal plant (often it is a law), but in remote areas it is possible to have the sludge digested in a special area in the willow facility by special methods, also developed by Centre of Recycling. After settling, the wastewater runs by gravitation to a pump well with a small electrical pump (might also be driven by wind or solarcells) since gravitation will not spread the wastewater effectively in the basin and the willow growth will not be optimal. A pump for a normal household will consume around 30 kWh a year, depending of distance from pumpwell to facility. Normally only a small pipe is enough for the transport of wastewater to the spreading system. The basin is 8 m wide and as long as needed. The needed length will differ very much form household to household, from area to area. In Denmark we have made facilities from 8 x 6 m to 8 x 60 m. A good "look" on very waterconsuming equipment inside the household will often bring the amout of wastewater down and so will also the needed size of the basin. In joint facilities the needed area per household also will decrease. Our newest methods of establisment has also put sizes down. And in Denmark a facility for one household is rarely more than 8 x 30 m. The soil from digging out the basin is used again to put in the facility after putting in drains, wells, spreading systems, etc. but if there is clay or silt, some washed sand is needed to have a good spreading of nutirents and water for the willow and to prevent wastewater in wrong places, on surface etc. The spreading system is in the center axis of the facility and it is placed as high as prevention of frost permits. On top of it there is a bank of soil. This will prevent smell from wastewater totally if it is placed correct and done properly. After that is just to plant willow cutlings. This has to be done in early spring and the wastewater has to be added right after planting. In this way the willowtrees will grow up and empty the soil during spring summer and autum, so that will be sufficiant room in soil for wastewater and rain falling directly in the facility during the winter. Willow will only be usable for the purpose in temperated areas and southern parts of arctic areas and only in both areas with special selected clones of willow (it is not meantmodified clones). Willow need winter to grow, but there are clones usable also for areas with short summers. In other areas different other trees are available for this purpose. Nutrients and heavy metals are effectively uptaken in the willow stems and foilage and approx. 10- 20 !! tonnes of dry matter per hectare are produced. The facilities will not affect the environment around it because it is completely closed by means of a non-permeable membrane made of polyethylene. On both sides this membrane is protected against damages from stones in the soil. This means that willow wastewater cleaning facilities can be used, also where wells are placed near the facilities without spoiling water quality from bacterial infections. It is important that households using willow wastewater cleaning facilities use soap, detergents, personal hygiene products, cleansing agents and so on that are naturally digestible. (All other types of facilities for wastewater should have the same attention on this issue). In that way substances will never be accumulated in the soil and the soil can be used as arable land after using the facility even after hundreds of years. Xenobiotic substances will in a willow facility be given a lot of time to be digested and area with the right moisty condition for bacterias will go up and down the soil many times during a year depending om rainwater amounts falling in the facility. This wil create moving zones with excellent conditions for bacterias to degrade xenobiotic substances as hormones etc. But the big size of willow facilities will mean a small load per area unit and this means that a willow facility will be even more stabile than other types of facilities for treatment of wastewater. 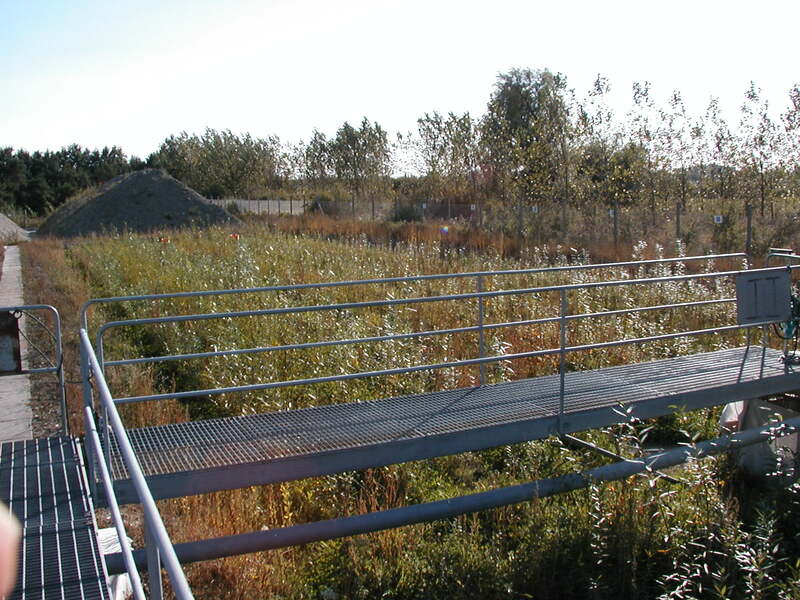 Industrial waste water can also be used in willow waste water-cleaning facilities in a very environmental secure way. It might be strained with non-degradable chemical substances, toxic to willows. But most of these can be substituted with natural digestible ones all over the industrial production process and willow clones suited for the rest can be used. By selections and substitutions a great amount of waste water can be made suitable for use in waste water cleaning facilities and great amounts of nutrients can be made viable for production of biomass from willow. Willow clones used for willow wastewater cleaning facilities are the newest and most quick- growing clones of Salix Viminalis. There are differences in uptake of different heavy metals between clones. Therefore analyses of wastewater could be a way to find three usable clones which can be used in an area. It is important to use at least three clones with different resistance to willow plant diseases among each other in every facility to keep diseases on a low level. Even that willow facilities are quite big a facility for one household can be build in 1½ day with an excavator and a clever and experienced man to operate it. This means that they can be quite cheap to build also because it is not needed to make long pipelines to get sufficient distance from wells, drains, lakes and rivers due to the membrane. And beside that a zero discharge facility will always be the best obtainable solution for the environment and the most secure system for the consumer. Here is meant also in relation to legislation which many countries are changing to protect environment. The latest change in EU is the Europens Water Act in which there are demands for protection of recipients and groundwater from phosphorus.